So as I mentioned in the introduction, the Daily Tend of Attacks chart shows a first part of the month quite lazy, and a pronounced ramp-up starting from the 19th. 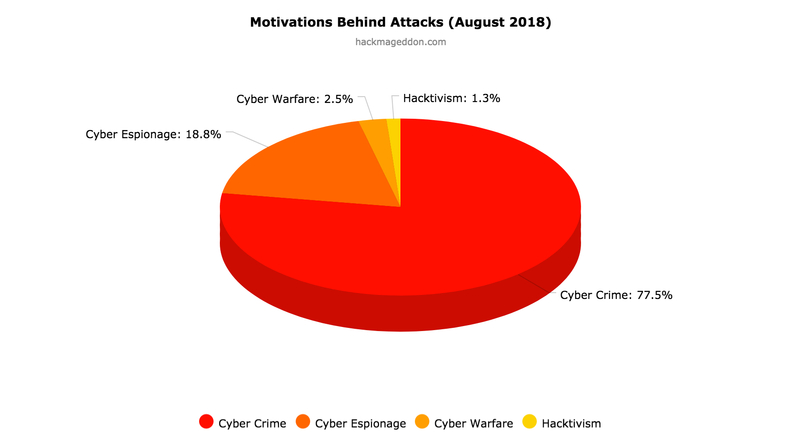 Even if Cyber Crime leads the Motivations Behind Attacks as usual, its percentage drops below the physiological threshold of 80%, something that did not happen since March (77.5% vs 81.5% in July). The difference is all in favor of Cyber Espionage that jumps to 18.8% from 14.6% in July). Cyberfare is stable at 2.5% (was 2.3% in July), while Hacktivism closes the chart with 1.3% (it was 1.5% in July). Malware is stable on top of the Attack Vectors chart with 35%, up from 29.2% of July, once again ahead of Account Hijackings nearly with the same value of July (18.8% vs 18.5%) and targeted attacks down to 12.5% from 14.6 in the previous month. Once again, unknown attack vectors rank at number four. Single Individuals rank on top of the Distribution of Targets chart with 22.5% (slightly up in comparison with the 20% of July). Public Administrations this month rank at number two with 17.5% (considerably up from the 12.3% if July when they ranked at number four). Multiple Industries confirm their third place with the same value of July (13.8%).